After Boom Years, Chinese Housing Market Looks Soft China's real estate market has boomed for years, but now there are signs of a slowdown. It comes as the world's most dynamic economy grapples with other challenges, including huge local government debt and slowing growth. About 100 recent homebuyers protested plunging real estate values at China Vanke, a Chinese real estate company, on Sunday in Shanghai. The protesters said they wore surgical masks to hide their identities. In recent years, China's real estate market has boomed. A three-bedroom apartment in Shanghai overlooking the river can still run more than $3 million, but that's beginning to change. Sales have begun to drop around the country in recent months. The slide comes as the world's most dynamic economy grapples with other challenges, including massive local government debt and slowing growth. 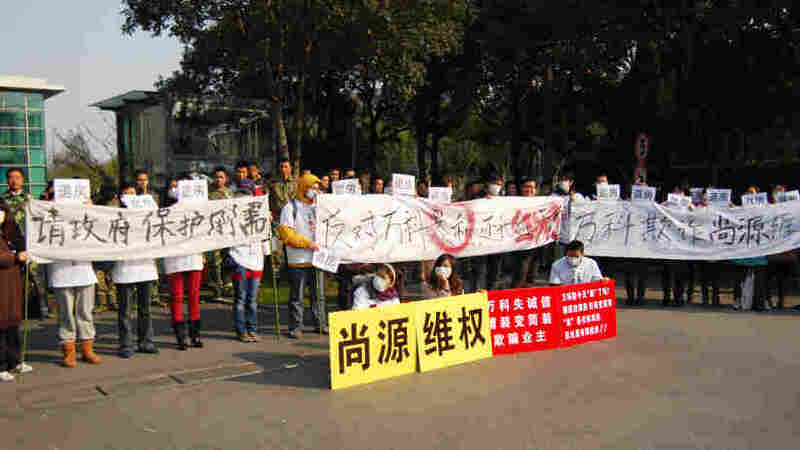 Falling prices have sparked protests against real estate companies in Beijing, Shanghai and the southern city of Nanjing. On Sunday, about 100 angry home buyers descended on the Shanghai headquarters of China Vanke, one of the nation's biggest property firms. "Vanke cheats! Give me back my hard-earned money!" a crowd chanted as it unfurled bed sheets and placards with messages criticizing the company. Real estate is a locomotive industry that leads at least 58 other industries. Doomsday probably won't come true in 2012, but for the Chinese economy, 2012 will be a very tough year. Vanke, which refused to talk for this story, posted guards in green camouflage uniforms at the front gate. Home buyers have recently overrun other Vanke offices in Shanghai and Beijing. Demonstrators wore surgical masks to hide their identities, saying they feared Vanke would try to seek retribution. One protester, a woman with the surname of Sun, bought a Vanke apartment in August. "The price was about $280,000," said the woman, who works at a video game company. "The price now is a bit more than $200,000." A fellow protester surnamed Ling — no one wanted to give their full names — said the company sold apartments, then slashed prices to attract new buyers and generate cash. Ling said the price of her apartment fell $60,000, or more than a quarter of its value, in just a few months. "Right now, I'm really furious with Vanke," said Ling, 26, who works for a company that makes fire protection products. "I can't accept losing $60,000, because my parents contributed some of that money and later, I will have to pay them back." Real estate analysts say demonstrations like this one are a sign of where China's property market is headed. Vanke reported home sales volume in November was 26 percent lower than the month before. Land sales in major cites have fallen 30 percent so far this year, according to Centaline, a Chinese real estate company. Cai Weimin, who runs a real estate think tank in Shanghai, made a prediction for the coming year. "On average, I think first tier cities like Shanghai will see house prices drop by 15 to 20 percent," said Cai. "Prices in second, third and fourth tier cities, that don't have home purchase limits, will fall at least 20 percent." So far, the decline in the market has been driven by Chinese government policies designed to deflate what is widely seen as a housing bubble. The government has increased down payment requirements and limited the number of homes people can buy. Most observers don't expect the market to collapse, but given the slowing growth of China's economy and its exports, there's anxiety. Cai says a steeper price drop would affect everyone from steel manufacturers to furniture makers. "Real estate is a locomotive industry that leads at least 58 other industries," Cai said. "Doomsday probably won't come true in 2012, but for the Chinese economy, 2012 will be a very tough year." Cai thinks a real estate contraction would also affect other countries that have relied on China's heavy demand for raw materials and natural resources. "The most obvious example is iron ore from Australia," he said. "We were very dependent on it, which caused its prices to skyrocket. Once we become less dependent in the future, prices will not hold up." China has avoided economic downturns in the past with massive stimulus spending. Beginning in 2008, the government spent trillions of dollars to cushion the blow from the global financial crisis. Ma Ji, a senior marketing manager with Gemdale, a Chinese development company, said some of that government stimulus money was diverted into real estate and pumped up property prices. "As for how stimulus money got into the hands of individual speculators, we have no way to know," said Ma. "But it is certain that investors got stimulus money through the government, state-owned companies or banks." Ma said many developers have good profit margins and can probably manage some drop in prices. But he worries others won't be able to make loan payments. Ma expects bankruptcies to begin hitting this spring. "As for how many, I cannot give you a percentage," said Ma, "but I am sure that some developers will go bankrupt." The timing of all this is not good. As the United States and Europe continue to grapple with debt, they are hoping China remains strong and stable. But as the recent slide in real estate suggests, the world's second-largest economy faces a challenging year ahead.